Lent has some great representation in the history of art. Living in a such a Catholic nation, Spanish artists seem to offer some of the most profound examples. Greco’s Ghosts has discussed Lent before, in an article about Goya’s entertaining yet creepy painting, Burial of the Sardine. 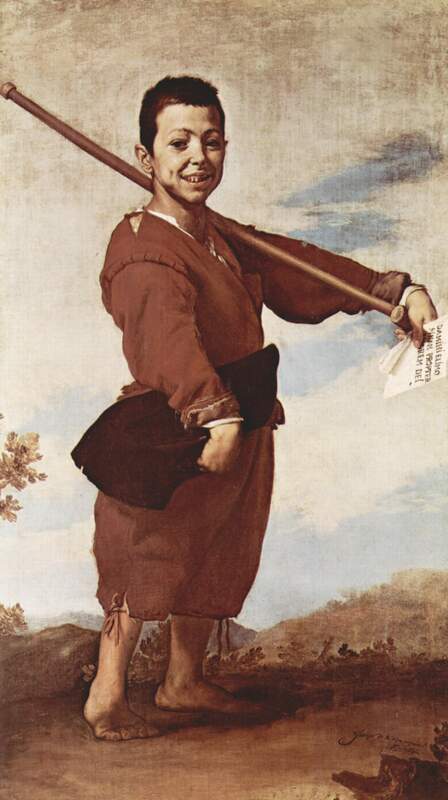 Now we turn to José de Ribera, called Jusepe de Ribera, a baroque painter out of Valencia who spent most of his life in Italy, and a particularly significant work about a seemingly insignificant subject, The Clubfoot, or, The Clubfooted Boy. Thought to be a pupil of Francisco Ribalta, Ribera spent a couple of years in Rome where he joined the followers of Caravaggio, developing the tenebrist style. He eventually moved to Naples which was at the time a kingdom under Spanish rule, where he would spend the rest of his life. There he would be an active competitor against Reni, Domenichino, and Annibale Carracci, and establish himself as a prosperous painter. Ribera is known well for his ability to portray religious subjects as realistic but with dignity. He would often paint saints, for example, against dark backgrounds and with all the wrinkles and ailments of a old body, but would highlight the spirituality of the subject with intensely contrasting light. Click image to enlarge. Jusepe de Ribera (Spanish), The Clubfoot, 1642, oil on canvas, 164 x 92 cm, Musée du Louvre, Paris. Alms, or almsgiving, is giving to others as an act of virtue. Almsgiving includes material charity, or the giving of capabilities or services, such as educational services. In Christian tradition, the giving of alms is most often a charitable gift to a less fortunate individual, and considered an expression of love to echo those made by Jesus. The giving of alms is a particular focus during the season of Lent, a time in the liturgical calendar dedicated to self sacrifice. Thus an important part of spiritual life, almsgiving today can include the donation of money, goods, time, services, or other things for the benefit of another person in need (and not yourself). Anyone need a hug? Hugging a filthy, stinky person who you normally wouldn’t want to hug, but who really needs a hug, counts today as giving alms, just as giving food to a homeless shelter or writing a check to support cancer research does. Click image to enlarge. Jusepe de Ribera (Spanish), The Clubfoot, detail of upper torso and head. Click image to enlarge. Jusepe de Ribera (Spanish), The Clubfoot, detail of torso. Click image to enlarge. 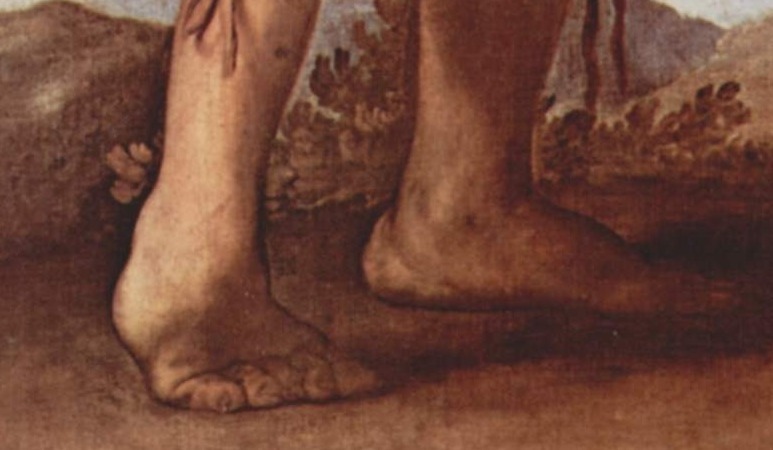 Jusepe de Ribera (Spanish), The Clubfoot, detail of feet. Despite his disheveled appearance and unfortunate situation, the boy stands tall and grins proudly, displaying a set of thick gums and deformed teeth. But Ribera does not demand sympathy of this boy, so much as respect. He does not place him at a distance in a miserable setting, but in a luminous landscape, a composition similar to that of a portrait of a regal individual. The boy strike’s a princely pose, brandishing his crutch over his shoulder as if he were hoisting a sword and entering a scene as a conquering hero. 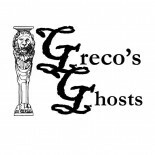 His posture is upright, and he displays his crippled foot with pride, keeping the weight on his good foot and moving his clubbed foot slightly sideways and into the light. 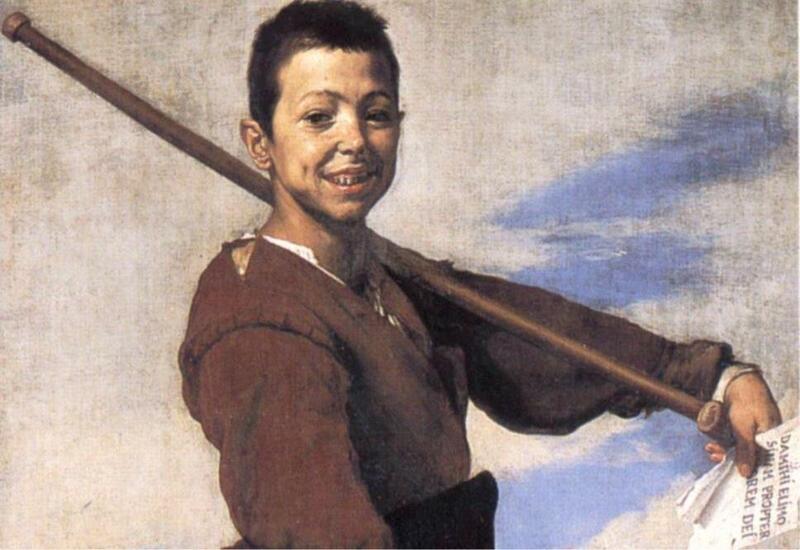 Ribera presents the boy close up and at a low angle, so as to endow him with dignity and make him appear monumental (1).Unlike our worldly expectations of images of pitiable poor folk, the Clubfooted Boy is anything but. The artist portrays him as a standing reminder that all creatures are equal before God. 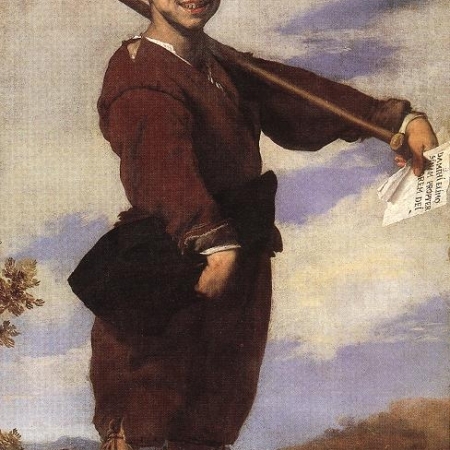 The boy will take his paper sign and beg for mercy, and Ribera claims the boy’s right to it. So give him alms, for the love of God. This entry was posted on March 6, 2015 by KristyDurk in Baroque, European, Italian, Realism, Seventeenth Century, Spanish and tagged alms, almsgiving, Carracci, charity, cripple, disability, Domenichino, Goya, landscape, Lent, Louvre, Naples, poor, reni, Ribalta, Ribera, Rome, Valencia.